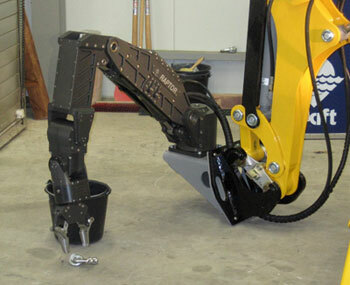 Kraft manipulator arms have been installed on a variety of remote controlled Brokk machines. 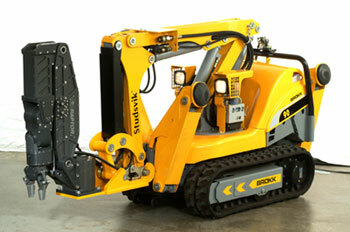 The Brokk machine provides an excellent platform from which a Kraft force feedback arm can be deployed. Installation of the arm at the end of the articulated Brokk boom provides terrific access in many work scenarios. By combining the power and mobility of a Brokk machine with the dexterity and intuitive control of a Kraft manipulator arm, the operator is able to perform the work of human hands, but from a safe remote location. 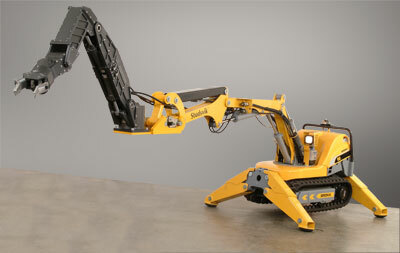 The Brokk 90 with a Kraft Raptor arm is compact and able to maneuver in very confined spaces. A Kraft Raptor arm on a Brokk 90 is used for the remote handling of nuclear waste at the Kernforschungszentrum (Nuclear Research Center) in Karlsruhe Germany. The two arms in combination provide an unprecedented reach with exceptional stability.